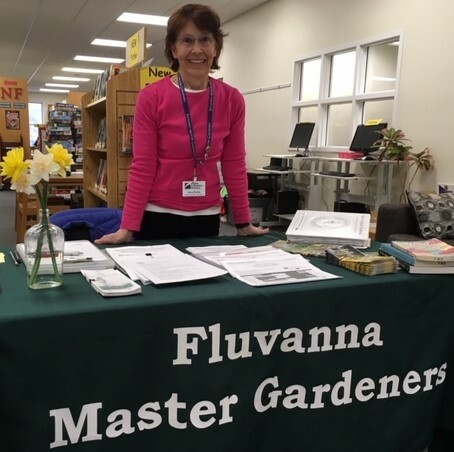 The Fluvanna Master Gardeners Horticultural Help Desk is on-site at the Fluvanna Public Library every Tuesday from 2 to 5 pm. Master Gardener Volunteers can answer your gardening questions and help diagnose plant problems. Numerous resource sheets from the Virginia Cooperative Extension office are also available for you to take home. You can also contact us year-round by clicking the Help Desk tab at top right of any FMG web-page and completing the Contact Us form. You can also call the Fluvanna VCE office in Fork Union at 434-591-1950 and ask the staff to convey your message to us. Bring us your gardening questions! Special note: If you wish to send a plant or insect sample to the VT Plant Clinic - PLEASE contact us FIRST for instructions on how to do this correctly or the Clinic may not be able to process your sample. Click on our Gardening Links section for instructions for submitting plant samples. FMG Plant Sale – Saturday April 28, 2018 – Rain or Shine! List of Plants for Sale: Click on title above to open new page and then scroll down and click on download. The FMG annual plant sale will be held from 9 am to Noon on Saturday April 28, 2018 at the Park and Ride parking lot across from the Food Lion and Good Neighbor Pharmacy shopping centers on Turkey Sag Trail in Palmyra. We will be selling locally grown plants Rain or Shine so come join us for the fun. There will be a variety of sun and shade loving flowering annuals, perrenials, herbs, tomatoes and peppers. Master Gardeners will be glad to answer any of your gardening questions. At 10 am we will also be presenting a free workshop - “Instant Gardens: Demonstration and Tips for Planting in Containers”. We take cash or checks made out to “FMG”. Sorry but we do not take charge cards. If you need further information, please contact us through our help desk. Fluvanna Cooperative Extension Master Gardeners (FCE-MG) volunteers can help you identify the mosquitos in your yard if you have concerns about disease-carrying insects. Mosquitoes to be submitted for identification will need to be adult stage and dead. If you have any questions, please contact VCE-MG at 434-591-1950, by the Contact tab at the top of this web page, or at any of our scheduled Help Desk sessions at the Fluvanna County Public Library. May 1 from 1pm to 3 pm - Jefferson Chapter of the Virginia Native Plant Society Annual Native Plant Sale at Ivy Creek Natural Area. Shop the Annual Native Plant Sale on May 1 at 1:00 pm in the barn. Join the largest crowd of the year at Ivy Creek for the Annual Native Plant Sale sponsored by the Jefferson Chapter of the Virginia Native Plant Society. Chapter members will have potted over 1,500 native plants with an emphasis on spring favorites: Virginia bluebells, trillium, Mayapple, wild ginger, Dutchman’s breeches, wild geranium, and others. Summer and fall flowering pollinator attractors including milkweed, beebalm, coneflowers, liatris, asters, and goldenrods will also be featured. Uncommon native trees and shrubs will be offered too. A large portion of the profits are donated to Ivy Creek Foundation, while other educational and conservation activities are also supported. These very affordably priced plants have sold out quickly. In conjunction with the Annual Plant Sale, Ivy Creek will be holding a Yard Sale near the kiosk as well. So check out what the winter and spring cleanings have cleared out from the attic and the barn. The Yard Sale will take place in the Education Building if the weather is wet. ------ The Ivy Creek Natural Area is located six miles north of Charlottesville, VA, at 1780 Earlysville Road. It is one half mile from the intersection of Hydraulic and West Rio Roads. (Google map).